One week down, fifteen to go! You can see that I’m still having a hard time sticking to an “easy” pace, even when doing intervals! That run on Thursday I was doing 3:1 intervals and still managed to run under an 11 min/mi pace! Several of my intervals were done at a sub-9 min pace. Argh! It’s because it was cold and dark and I was running alone (although with the group, so not completely alone…just no one else was doing my pace). 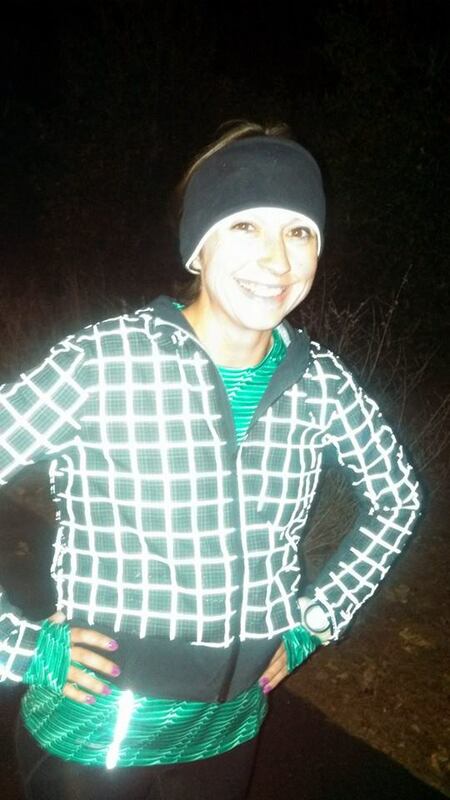 Highly reflective for nighttime running! I was equally as speedy on my long run! I was planning to run it without walk breaks, but after four too-fast miles, I started taking them every half mile or so. It didn’t help that it was in the 60s, and I didn’t have any water because the park took my water fountain away! I was majorly dehydrated by the end. Time to break out the water vest again. I also only got one out of three days of strength work in. I skipped Wednesday’s because I was sore from Monday, and I skipped Friday because I wasn’t home where my weights were. On Sunday, I volunteered at the Flying Monkey Marathon. It was raining off and on all morning, but luckily I was just handing out race packets under a tent for a couple hours, so I was shielded from most of it. So inspiring to see all of those who came out to run 26.2 insanely hilly miles in the rain! I came down with a cold on Monday, so it was all I could muster to run to the pharmacy and back. I felt a little better on Tuesday (and running has the added bonus of clearing up my sinuses), so I managed to make up the miles with a 5 miler of intervals. The rest of the week was pretty standard: Wednesday was a treadmill day, Thursday was with the group (and below freezing! ), and I did a one miler on Friday morning. Saturday was birthday celebration day, so I was up bright and early for the Hammer Down 10k. After that, I got a bit of relaxation and nap time before heading to the Preds game and then out to a bar with my friends. Sunday was a lazy day–cold and rainy–so I just finished up my streak and enjoyed my birthday for the remainder of the time. This was completed with the Walt Disney World Half Marathon and the Country Music Half Marathon. Run a sub-30 minute 5k. This was completed at the Smyrna Parks 5k in August. I volunteered at the Purity Dairy Dash back in April and will be doling out race packets at the Flying Monkey Marathon next weekend. Participate in a running streak for a month. Thirty-three days of running in a row DONE! Not a calendar month, but Merriam-Webster says it counts. I ran a total of 103 miles! The thing I’m most excited about now that my running streak is over? I don’t have to document every single run on Instagram anymore! I honestly didn’t intend to take a picture every day of my streak. I just started and then I felt weird stopping (like someone would think that I had missed a day or something, I don’t know). But I was running out of creative ideas for photos every day (and sometimes the landscape just wasn’t very inspiring…or too dark to see anything). Here are some of my favorites! Now, back to my normal, cat-heavy Instagram feed. With my birthday running steak coming to a close, it means, yes, it’s half marathon training time again! 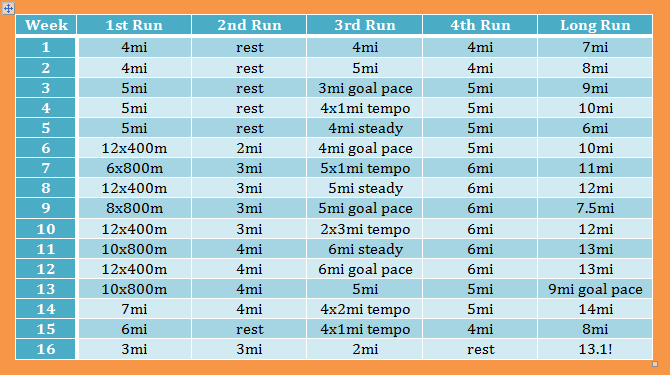 I’ve created the following training plan based mostly on Runkeeper’s sub-2:15 plan. However, I thought the long runs ramped up rather quickly (double digits on week 3 and 12 miles by week 6), so I stretched those out just a little bit. I also made the cutback weeks a little more cutback. Then I just kind of rearranged some stuff to make more sense for me. For example, I’m running a 5k race in week 3 and a 15k race in week 13. My goal race is the Tom King Classic on March 7th. I’m also running the Cedars Frostbite a month before as a supported long training run (aka, I don’t plan on even attempting to PR, so who wants to run with me?). Any run without a pace designation should be ran easy. This includes long runs. All other runs should include an easy-paced warm up and cool down of a mile or so each. All speed and tempo runs will have 2 minutes walking or jogging recovery between intervals. I will probably include strides at the end of a lot of the easy run as it gets closer to the date of the half. I plan to do strength training on non-running days. Yoga will follow the long run. I also have a fall-back training plan I can switch to if this one proves too much for me. It involves running every other day (3-4 times per week) instead of 4-5 times per week, and includes a cutback week every other week, so the overall mileage over the course of the plan is about 80 miles less. I’m most dreading the mid-week 7-9 mile runs I’m going to have to do on the treadmill because it will still be too dark outside to run after work. Luckily, it looks like there will be Preds games on most of those nights, so I will have something to watch. After this plan ends, another immediately begins. I haven’t fully worked out the details yet (I want to see how this training goes), but it will include another training race (Oak Barrel Half) and then a goal half at the end of April (Kentucky Derby miniMarathon). Yes, that’s four half marathons (plus a 15k!) in three months! After that, I plan on taking a long distance break and enjoying my summer before maybe attempting another in the fall. 2015 will be the year of the half! Kind of a speedy week! My run on Thursday was the fastest 3 miles I’ve ever run in training (my third fastest if you include races). I went out with the group, and it was cold and not a lot of people showed up. Not wanting to run alone in the dark, I stuck with some ladies who regularly run a little faster than I do. But I was able to keep up, even if my quads could really feel it the next day! Pretty good for having some 17-20 mph winds blowing at us! I found a new place to run on Sunday: Bells Bend Park. It consists of mostly grassy and some gravel trails through the country in one of the bends of the Cumberland. Hardly anyone else was out there, so it was pretty peaceful! Well, it would have been if my Garmin hadn’t started beeping about a low battery almost as soon as I got on the trail. It kept saying the battery was dead, then restarting itself, resulting in four ear-piercing beeps about every three seconds. I was very close to throwing it into the surrounding fields. It continued to beep the entire ride home. I don’t understand how it had the power to keep restarting itself and beeping so much if the battery was as low as it claimed. So I probably would have done more mileage on Sunday, but I was about to go insane because of the watch after 3.8.